Walk firmly in your own shoes, it is who you are. 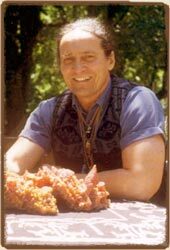 Herb Stevenson is the founder of the Natural Passages. He is President/CEO of the Cleveland Consulting Group, Inc., where he is an executive coach and management consultant. Herb is listed on eight Who's Who lists including Who's Who in Finance and Industry, Who's Who In American Law, and Who's Who in American Education. He is on the graduate faculty at Cleveland State University and the postgraduate faculty of the Gestalt Institute of Cleveland. He facilitates Men's Circles in the Cleveland area. He is on the Board of Trustees of The American Indian Education Center in Cleveland, Ohio. Herb has spent the last decade reclaiming his Cherokee and Shawnee Indian heritage. He provides workshops around the country on indigenous healing practices. A collection of his writing, including book chapters, articles and poetry, can be found at www.herbstevenson.com.